All our veterinarians and technicians are Fear Free Certified! Dr. McCoury is a 1988 Washington State graduate. She has practiced in Western Washington since graduation. 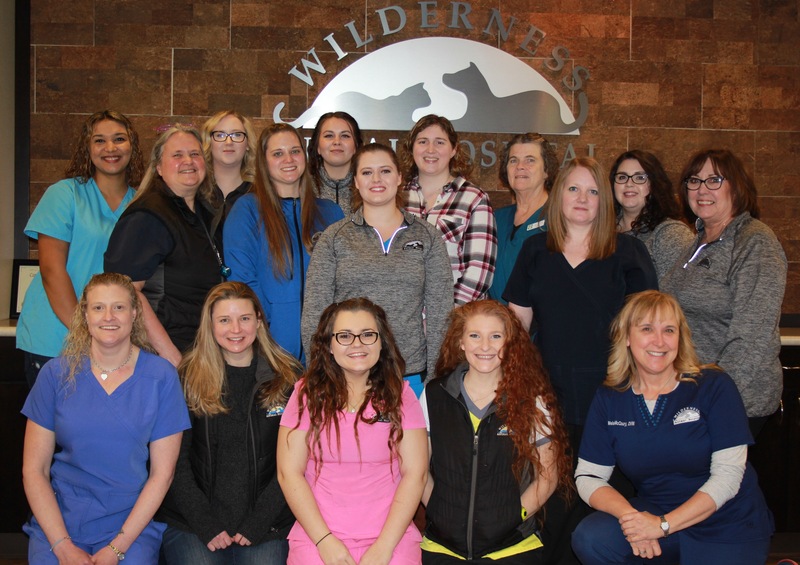 She purchased Wilderness Veterinary Clinic from Dr. Reed in August 2006. Prior to that she worked at a practice that did routine and critical care for 10 years. Dr. McCoury enjoys spending with her daughter, Brianne, and her t australian shepherd, Emerson. She also likes traveling and fixer upper projects at home. She also enjoys raising, riding and training horses for dressage. Dr. McCoury is especially interested in Fear Free practice, preventive care, dentistry and internal medicine. Dr. Tate is a 1992 Michigan State graduate. Since graduation, he moved to the Seattle area and has been practicing in the South Puget Sound area. In his spare time, Dr. Tate enjoys cooking and gardening. He and his wife Wendy have four grown children and two grandchildren. Dr. Tate’s areas of professional interest include avian, exotics, small mammals, dogs and cats. Dr. Wieringa is a 2001 graduate of the University of Illinois. She is originally from the Chicago area and moved to Western Washington shortly after graduation. Prior to attending veterinary school she obtained her undergraduate degree from Marquette University. She worked in a general practice/emergency hospital for 6 years, and then worked at a specialty referral hospital practicing exclusively emergency medicine for 8 years before joining Wilderness Animal Hospital. Dr. Wieringa has two young boys. She enjoys spending time with her family and being outdoors as much as possible. Her professional interests include small animal medicine, surgery, and emergency medicine. Dr. Deana McReynolds received her Doctorate of Veterinary Medicine in 1997 from Washington State University. She has practiced in the Seattle/Tacoma area ever since. She believes that we live healthier, happier lives when sharing that life with an animal. She is dedicated to helping your pet live a long, happy life. Her passions include nutrition, behavioral medicine and gentle handling and restraint techniques. She is pleased to be working in a practice that is Feline Friendly Gold Certified and helping us become certified as Fear Free practice. Dr. Deana has shared her life with both dogs and cats in the past, including two English bulldogs. She now lives in SeaTac with a crazy yellow lab/greyhound mix named Kia. Dr. Simpson is a 2017 graduate of the Veterinary School of Medicine at the University of Missouri. She began working at Wilderness Animal Hospital shortly after graduation. In addition to her rigorous training at Mizzou, she studied under a variety of veterinary specialists across the country in the fields of internal medicine, dermatology, emergency medicine, general surgery, ophthalmology, dentistry, and shelter medicine. Dr. Simpson lives just south of Maple Valley with her husband, young daughter, three cats and two rescue dogs. Aside from her two- and four-legged family, Dr. Simpson enjoys playing piano, reading, cooking and spending time outdoors. Sarah has been with the hospital since 2000. She attended the Veterinary Technology program at Pierce College graduating in 2005. She enjoys spending time with her husband Shawn and sons Brayden and Cody. They also have one very active border collie, Aurora. Helen joined us July 2017. She was born in Aberdeen, Scotland and moved to the United States when she was 10. She became interested in Veterinary Medicine in 1996, when she took a job as a receptionist in a one doctor practice. Since then with her years of experience, she was able to become a licensed veterinary technician (LVT). Helen has worked with large animals, exotics, as well as cats and dogs in both large and small clinics. She brings over 21 years of experience to us, along with her love of animals. Helen shares her home with her 7 1/2 year old red nose pitbull mix Bella. Bella has shared her home with a few birds, a couple of frogs and a rabbit over the years. Sara graduated in 2002 from the Veterinary Technician program in Minnesota. She started working at the University of Minnesota for the following two years after graduation. She moved to Colorado where she fell in love with working in a small animal practice. Sara also had the opportunity to work at a hospital in Virginia that was home to two goats, four sheep and a donkey. Most recently, Sara has been working in Washington State with some wildlife, but is always drawn back to what she truly enjoys, getting to know cats and dogs through their life stages. Sara has three cats at home; Chase, Kota and Blink. She has two children, McKenna and Cole who keep Sara and her husband busy taking them to a variety of activities. Carol joined our Team December 2016. She has been in the management and operations field for 30+ years. She enjoys family time, travel and Charlie, her 2 year old Shih Tzu mix. We are excited for her to join our team.